“The truly royal Marie-Luise Neunecker plays the horn with melodic grace and effortless, supple lines, something other horn players can only dream of” wrote the Berliner Morgenpost about Marie-Luise Neunecker. Hailed for her exceptional talent and virtuosity, she is widely regarded as one of the leading and most distinguished horn players of today. She has built a successful international career and is much in demand as soloist and chamber musician. During her tenure as principal horn of the Bamberg Symphony Orchestra and the Frankfurt Radio Symphony Orchestra from 1979 to 1989, she attracted attention as prize winner at several prestigious international competitions such as the German Music Competition in Bonn (1982), the ARD competition in Munich (1983) and the Concert Artists’ Guild Competition in New York (1986). Today, she is invited to the world’s most renowned concert venues. In 2013, Marie-Luise Neunecker was awarded the renowned Frankfurt Music Prize. Besides her being a successful soloist with ensembles such as the radio symphony orchestras of the NDR, SWR, MDR, HR, the Gewandhausorchester Leipzig, Wiener Philharmoniker as well as the Bamberg Symphony, Marie-Luise Neunecker also appears regularly as a chamber musician. She works together with partners like Frank Peter Zimmermann, Christian Tetzlaff, Lars Vogt, Antje Weithaas, Andreas Schiff, Martha Argerich and Pierre Laurent Aimard, as well as with the Zehetmair Quartet. György Ligeti wrote his “Hamburgisches Konzert” for Marie-Luise Neunecker, who performed its world premiere in January 2001. Since then, she has played the concerto numerous times in several countries. She has released it on CD with the Asko Ensemble under the direction of Reinbert de Leeuw for the Ligeti Edition of Warner Classics. Marie-Luise Neunecker receives regular invitations from major festivals both as soloist and as chamber musician. She is a frequent guest artist at the Salzburg Festival, the Schleswig-Holstein Music Festival, the Aldeburgh Festival, the Rheingau Musik Festival, the Marlboro Music Festival, the Risör Festival as well as at the Vienna Festive Weeks. Her numerous CD recordings, decorated with prizes such as the ECHO Klassik and the Grammy Award, have not only demonstrated her outstanding quality as an artist and her exceptional musical versatility, they have also contributed to a wider knowledge of horn repertory of various epochs. She released the Strauss Concertos with the Bamberg Symphonic Orchestra under the direction of Ingo Metzmacher and Britten’s Horn Serenade with the tenor Ian Bostridge. Other CD recordings include the Hindemith Concerto, Horn Concertos by Russian composers Reinhold Glière, Alexander Glazunov and Vissarion Shebalin and a recording of works by Othmar Schoeck, Charles Koechlin and Ethel Smyth. As a chamber musician she has released recordings of the horn trios by Brahms with Frank Peter Zimmermann and Wolfgang Sawallisch and most recently, with Lars Vogt on piano, a CD with works by Hindemith, Kirchner, Brahms, Beethoven and Schumann. 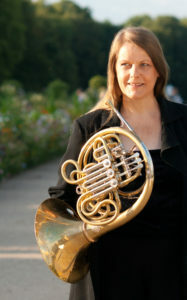 Marie-Luise Neunecker is professor of horn at the Hanns Eisler Academy of Music in Berlin.